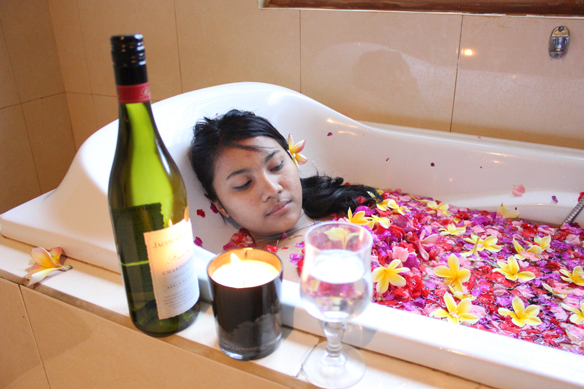 One of the largest spas in Denpasar Bali, has been designed with a strong influence of Balinese & Healing system. Enjoy the rituals of journey through sacred Eastern traditions of health and beauty. Our Theraphyst’s skills are also Spiritual, Yoga, meditation, Prana breath, by those skill they can serve better massage and other treatments with more concentration and pure services The treatment rooms are the perfect space to relax completely under the trained hands of your therapist. The perfect place to treat that special person…enjoy G-Spa At G-Spa room with Typical Balinese Spa music to relax together and share an experience that will surely be one of the highlights of your memorable holiday in Bali. G-Spa always pray for your health and long life. Balinese tradisional massage using acupressure teckniques of Balinese touches and relaxing stretching in order to improve blood circulation and tired aching mucles. Ginger tea will be served. Warm stone massage is a traditional massage which uses warm stones to provide and hold a sustained heat to specific areas of the body. This eases stress and tension and increases circulation to the affected tissues resulting in a relaxed revitalized and rejuvenated body and make better blood circulation as well. Aromatherapy massage is the combination of techniques of traditional massage, with essential oils. When a Aromatherapy massage is performed, great attention is paid to the scents used in the massage natural oil. Reflexology is a Tradional massage technique that focuses on the Legs and feet , It provides relief and improves general health by relieving in important pressure points on the feet, since feet is one of the nerve center. Ear Candle is one of the unique and natural technique to remove excess wax and debris from inner ears, it is safe and relaxing process to relieve pressure in the ear canal, work, wonder for sinus, sore throat, stress, and very relexing. Please Book your Spa tratment online and recive 30 % DISCOUNT on above rates ! !